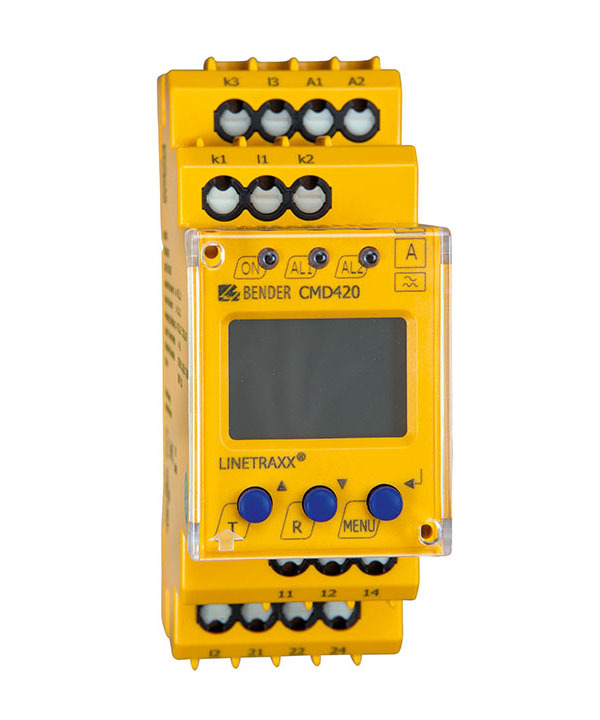 The CMD420/421 current monitoring devices monitor AC currents using three measuring inputs for overcurrent, undercurrent or undercurrent and overcurrent (window discriminator function). The currents are measured as r.m.s. values (AC). The currently measured values are continuously shown on the LC display. The respective measuring channel can be selected using the Arrow up or Arrow down button. The measured values causing the alarm relay to switch are stored. Due to adjustable delay times, installation-specific characteristics, such as devicespecific making currents, short-time current changes etc. can be considered. For the measurement three standard current transformers are to be connected to the respective CMD420/421. The transformation ratio "n" of the current transformers (n = x/1A resp. n = x/5A) can be set up to a factor of n = 2000. Then the actual current of the installation can be calculated by multiplying the measured current by factor "n" and indicated on the display. The currents can derive from a 3-phase system or from three different single-phase systems.